As many have picked up from the sudden proliferation of my mid-day Instagram posts, I no longer work at Good Eggs. Those of you in the Bay Area and following food news might have read about the round of layoffs and closures that happened in early August; I was among the crew let go. If you know me well, you will know that I loved working there these past two years, pursuing a mission I believed in and working with amazing people. So I am, of course, disappointed, and I have experienced the full range of emotion that you might expect to come in tandem with such an experience. But it was a fantastic run. I am immensely grateful for that. However, it has been a strange month—some of it good, some of it bad, most of it confusing. I’ve had fun, of course! Ben and I had two free days betwixt his summer job of painting and the start of the school year, so we went to Point Reyes to walk for miles and gaze at elk. I’ve bumped around town during the day and slept in and said yes to things I’d have had to turn down before. I’ve become enamored with breakfast at Pizzaiolo. But in reality, I’m not one of those people who can just enjoy the ride! I want to know what’s next. I want structure. I want to feel purposeful. In some ways, I know what I’d like to do next. But in other ways, I’m puzzled, even when I interview for jobs that seem in line with my aspirations. I don’t want to rush back to the grind that it seems most of us experience in our working lives. I would like a little balance. I know too many people who have worked a corporate job and then left, disillusioned and cynical, to pursue something that felt more meaningful. I’m increasingly tentative about startups, especially those hawking a product that seems unnecessary or replicated a million other times. I can’t help but take a long view: What do I want my life to look like in 10 years? Why should I choose to run the rat race when I’ve seen so many succeed unhappily? What sort of career will let me have a robust, restful, thoughtful life—and, someday, a kid or two? I would like to keep sleeping enough. I would like to keep cooking dinner. The future of work is unclear (to me and others), and to further complicate things, I am a classic jack-of-all-trades, a poster girl for my liberal arts education. We no longer have career paths but rather mazes, as a friend wisely put it. So, what to do? I know things will work out no matter what I choose. I say to the friends with whom I lost my job, It’s a great, big, wonderful world! Amazing things will happen! And I do believe that. But I sure wish someone else could make a few decisions for me. For now, I am working at Ordinaire, my long-beloved neighborhood natural wine bar, getting things organized (my forte!) and helping out behind the bar as well. This has been wonderful. Great people, great wine and purpose to boot. I can hardly believe I work there, considering how long and how fervently I’ve loved the place. I don’t know how long I’ll be able to do this, but I’m grateful for it. I’m learning a lot, exploring a field I find compelling, resting in something that’s good in a very basic way. These past weeks have reminded me anew of how quickly we wrap up our identity in our careers. I’m working on adjusting my sense of self and well-honed resume pitch into something that’s applicable to my whole life, to the values I hold and work toward regardless of the title I might hold at any given moment. I never again want to lose or leave a job and feel unsure of who I am and what I offer to the world when my everyday responsibilities are stripped away. That’s all I will say about this for now. I just wanted to come out of the closet with the news, open this space to the things I want to write about at this moment: the confusion of in-between seasons, the goings on at Ordinaire, the likely reason why I’m so relieved by autumn this year. This is the season of not knowing. It is the season of big salads for lunch, of novels, of natural wine in abundance, of occasionally sleeping 9 hours, of a faint but constant buzz of confusion in my ears. And maybe that’s okay. It’s likely I will look back fondly. I will probably discover something meaningful. And I will definitely survive. Since I’ve been tasked with making my lunch once again (thanks for feeding me for these many months, Good Eggs kitchen team! I miss you! ), some version of this salad has been making an appearance on my plate at lunchtime several days a week. I’ve gotten numerous questions about the dressing and preparation, so I figured I ought to share. It’s incredibly easy, delicious and wonderfully healthful, too. Collard greens and thinly sliced cabbage also work well here, instead of or along with the kale. So do zucchini noodles, which I make with a simple julienne peeler. You can also change things up by swapping out the tahini for peanut or almond butter. I’ve mentioned some of my favorite additions and toppings below, but this is only an outline: take whatever liberties you like! To make the dressing, put the tahini into a large bowl. Add a pinch of salt, some freshly cracked black pepper and the pepper flakes, lemon zest and/or chili paste, if using. Stir to combine. The mixture will be very thick. Add a big splash of whatever vinegar you choose and stir again. Add water, a teaspoon or so at a time, until the dressing reaches the consistency you like. I like to keep it pretty thick, as too much water dilutes the flavor. Taste and adjust the seasoning as necessary. Cut the kale into thin ribbons. I like to roll it up (parallel to the stem, the long way) then slice it as with a chiffonade. Put the kale and any additions you like into the bowl. Toss the salad with your hands until the dressing has thoroughly coated the kale. Taste and adjust again. I often add another pinch of salt or a bit more acid. Finish with a few more cracks of pepper and whatever toppings you like. Transfer to a plate (or plates, if you’re sharing) and enjoy! 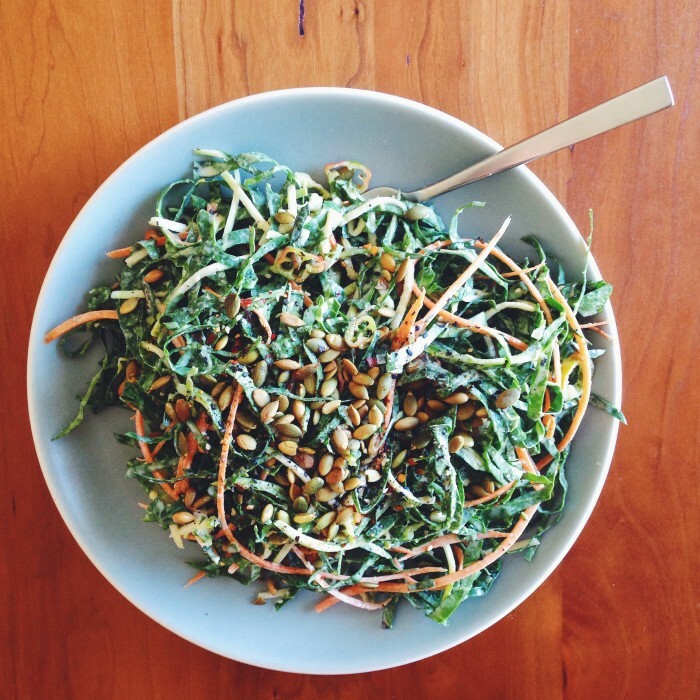 You have hugely inspired me with your story & wonderful salad, Stacy! And btw, I’m almost 50 & still wonder what ‘job’ will be next that will meet a balanced life. Good on you to have that perspective at a young age! Sorry for your loss at a job you truly enjoyed but way to go landing something for the interim. Beautiful, and a yummy looking salad to boot. About to be right there with you on the “What should I do with my life?” front as my husband wraps up college and we face what is almost certainly another cross country move. Inspired to see someone taking time off from the grind, resume gaps be damned, to pursue relaxation in a place as unlikely as the restaurant industry! That’s always been my comfort zone as well. Enjoy this season for all it’s worth. Thanks for the recipe! I had all the ingredients on hand and needed a last minute easy salad, so this was perfect timing! It was really delicious. Ugh, the issue of how best to trade your time for money is always a gut-wrenching one. So sad to hear about it but it is lovely to hear other people going through the struggle (misery, company, it’s still true, right?). Best of luck finding a new gig and enjoying your time between now and then. Also, after seeing this I am *this close* to stopping for kale on the way home so I can make this. It just looks so fresh and beautiful. i’m sorry about your recent layoff, but i’m so impressed by the sense of acceptance, calm, and dignity i get from your writing here–i find that totally admirable. thanks for sharing. 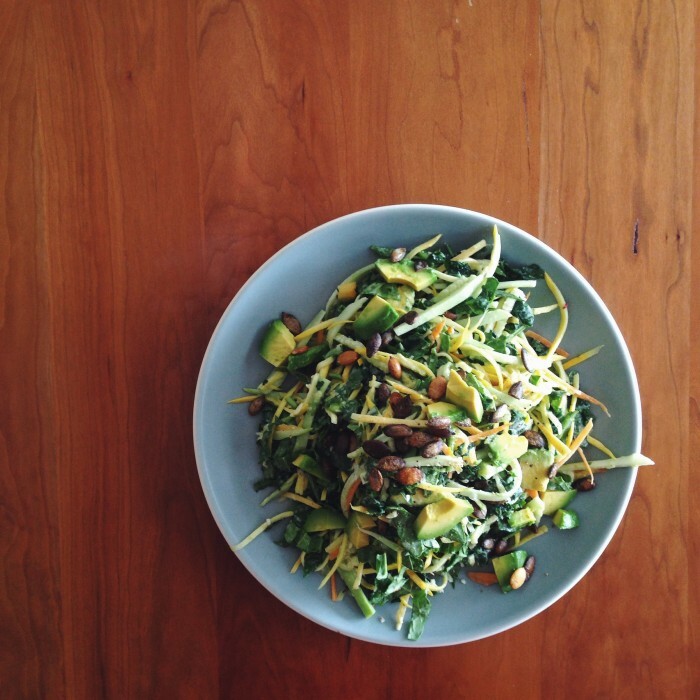 this kale salad is so my speed–i’m always ready to collect a simple, vibrant, no-fuss meal. i whipped up the dressing last night to toss with some kale, butternut squash, and lentils–it was satisfying and delicious. wishing you the best in this transitory (and maybe really positively impactful) time.